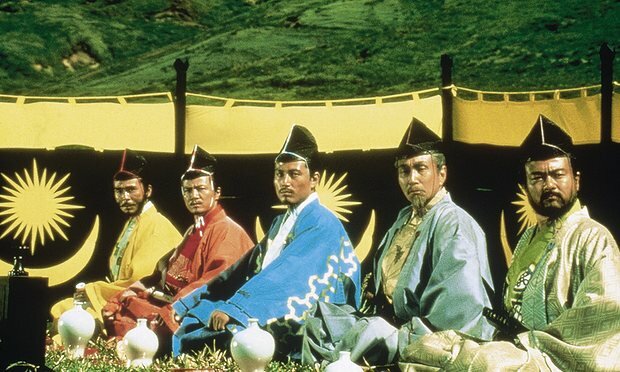 If there ever was a film that would thrive through restoration, Akira Kurosawa’s 1985 epic Ran is that, and thanks to Studio Canal we are able to experience the film in all of its elegance. Based selectively on Shakespeare’s King Lear and rooted in Japanese folklore, Ran follows a father and his three sons as corruption and competition throw them into war with each other. This invokes a dichotomy of status and influence, especially in the state of battle, where one’s great power can be lost and taken by another at the drop of a hat. Whilst a large part of the films quality surrounds the visual, it would be remiss to ignore the prose itself. Obviously I cannot speak for the original Japanese language, but there is certainly a lot to admire in the English subtitles – a somewhat promising sign that good writing has survived and transcended the translation. Lady Kaeda (Mieko Harada) is one of the more intriguing characters in the film, as her manipulation and power plays make her somewhat secretly the central character of the film, orchestrating a lot of the film’s events. Arguably the greatest product of this conflict narrative is the visual representation of said war and individual battles. Ran is the epitome of grandeur from both a production and visual standpoint, which happily merge together to form an outstanding product. The 1400 plus extras, the actual castle built for the film on the side of Mount Fuji and the fact it was at the time Japan’s most expensive film, mean that these all add up to craft a great sense of significance and only add to the already strong viewer immersion. But what would all the lavish production be without the clear aesthetic direction of Kurosawa. The incredible colour on display is a standout aspect of both the film and the restoration. I never thought I would be gushing over a film for its use of the colour red but Ran has obviously changed that. From the vast red banners and armour to the simple red explosive flashes of rifles and near artistically painted blood, colour finds itself beautifully at the forefront of the film. The deep and all-showing long shots that are ever frequent in the film really exhibit the impressive scale of the film and allow you to take in every detail Kurosawa paints. On a point of visual splendour, I have absolutely no doubt that this restoration in question is a stunning one. One might not be mistaken in thinking that it was a film that had come out in the past couple of years, not thirty years ago. One of the more known shots in the film – that of Hidetora walking down the steps of his burning castle as the two armies wait for him – was particularly impressive, with the smoke and flames engulfing the castle providing a splendid backdrop to the aforementioned gorgeous colour of the soldiers. As per usual with good restorations, it looks considerably cleaner and sharper, but something that only the top tier of restorations achieve is that it looks like how you think it should look. in a sense that memory fails in remembering how unclean and janky some things can look like; fortunately with this restoration of Ran, how you think it should look is exactly how it does look. Despite my own personal problems with length in film, Ran possessed a strong sense of pace, bookmarking its major ‘events’ and balancing the various characters well. That, along with the visual opulence make Ran more than worthy of association with the ‘Epic’, and a restoration as good as this leaves no excuse not to experience it, even if you have seen it before.